The city of Brighton is easy to travel around by foot, but the public transport system provides the most popular way to travel in the Brighton and Hove area. There is an excellent network of buses and trains, providing this popular seaside resort with good connections throughout England. 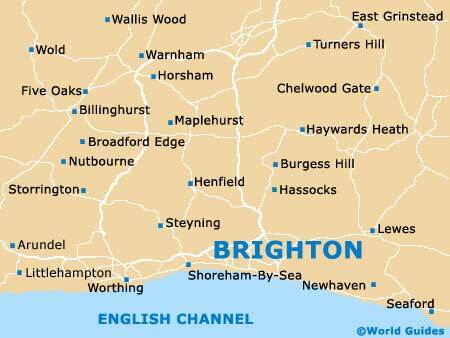 Brighton is located close to many other interesting towns and cities, such as Crawley, Horsham and Royal Tunbridge Wells. Renting a car is often the preferred method of transport when travelling outside of Brighton and it is relatively easy to travel around East Sussex by car. There are a number of major roads situated on the outskirts, such as the A259 (Kingsway / Marine Drive / South Coast Road). Brighton is served by several London airports, including Heathrow Airport (LHR), Gatwick Airport (LGW), Stansted Airport (STN) and London City Airport (LCY) which are within easy travelling distance of Brighton, by either train, coach or car. The Brighton and Hove area is served by a number of major roads and nearby the city connects to a number of motorways, providing fast travel to many areas of England, including London which can be reached in less than 90 minutes, via the M23 and M25. Although the traffic in and out of Brighton can be heavy during peak commuting hours (07:30 to 10:00 and 16:00 to 18:00), driving along the coastline is fairly easy. Many tourists staying in Brighton choose to rent cars and these are the best method of transport when travelling outside of the city to explore the surrounding countryside and nearby towns. There are plenty of parking garages and off-street parking areas available in Brighton, although some central areas are restricted to residents only. There is also a Park and Ride scheme available at Withdean Stadium, on the outskirts, with regular Park and Ride buses travelling into central Brighton around every 12 minutes. The Park and Ride service is available from Monday to Friday between 07:30 to 18:00 and on Saturday between 09:00 to 17:45. Car parks are located at Madeira Drive (close to the Pier and Brighton Marina), along the Kingsway in Hove and at Train Station. Parking vouchers are often required when parking on streets and these are readily available in shops and garages displaying the Voucher Parking symbol. Book your Brighton Car Rental here. Cycle lanes in Brighton are located along the seafront, on Lewes Road and at Victoria Gardens. There are numerous cycle racks located throughout the city centre and also a number of bicycle rental shops. 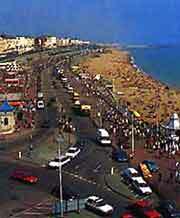 Brighton and Hove has an excellent bus service, providing regular bus travel and good value for money. With a number of efficient bus lanes, allowing buses to travel around the area quickly, buses stop every few minutes on the main bus routes. Many buses can be easily accessed by wheelchair users and are environmentally friendly. Buses are operated by the Brighton and Hove Bus Company and provide travel throughout the area and nearby East Sussex towns. Bus passes are available for set periods and these can be particularly convenient when travelling in Brighton. Coaches are operated by National Express and Stagecoach, providing affordable travel throughout the United Kingdom. The bus and coach station is situated at Pool Valley, close to the city centre, while many buses also stop at Churchill Square. 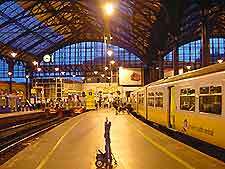 Brighton has a large train network, providing good connections throughout the country. With regular trains travelling to central London in less than one hour, and also Gatwick Airport, trains provide one of the quickest ways to travel outside of Brighton and Hove. Taxis in Brighton and Hove provide one of the most convenient and popular ways to travel around and are usually reasonably priced. The main taxi ranks are located on East Street, Western Road, the Lanes, Hove Town Hall and at Queen's Square. It is also possible to hail cabs from the street.